As cities become more crowded, people who want to live in the city center will have to choose between living in smaller spaces or using neglected spaces like waterways. Choosing the latter, Sanitov Floating Homes designed INACHUS, an innovative, modern house that is extremely functional, has a luscious living green wall, uses recycled materials, and is powered by the sun! We toured the home at this year's London Design Festival, which kicked off yesterday. 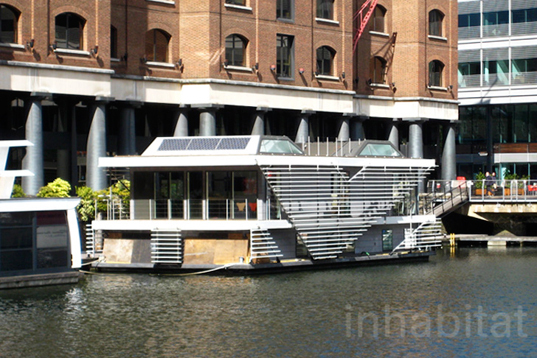 This gorgeous drifting home might be a future solution for urban living. 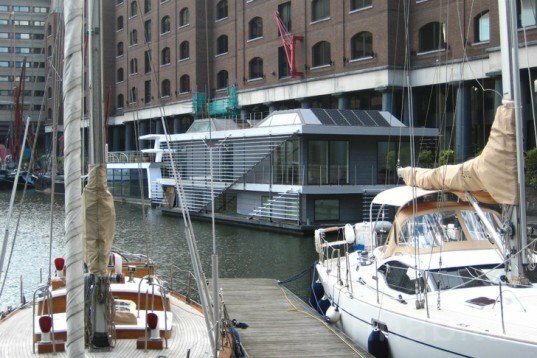 Moored within St. Katharine Docks, just minutes away from the iconic Tower Bridge, INACHUS was being built in Kent at this time last year. 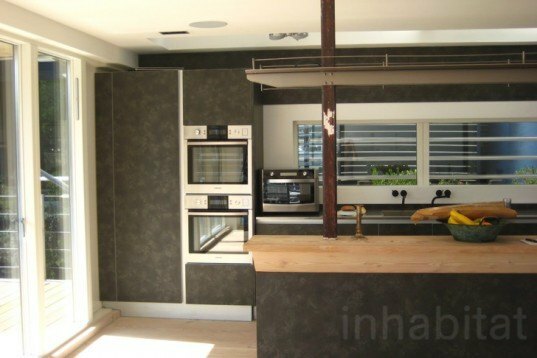 Featuring two floors, this house accommodates three bedrooms, two bathrooms (with a sauna! ), an open plan living room and kitchen, wrap-around balconies, and a grand terrace for some cloud gazing. The home is extremely energy efficient, and it features solar panels, double and triple glazing, great quality insulation, crossed ventilation, plenty of windows and layered fins on both sides that regulate sunshine and bounce off winds stabilizing the house. Alexander Host, one of the Danish designers behind the project, kindly gave us a private tour around the space, which is also where he is staying during the Festival. We started the visit from the terrace, which has a Nordic style hot tub and enjoys great views overlooking the marina. The terrace will be soon topped by a green roof, and inside, a living green wall greets people at the entrance. The light, open floorplan of the living area is filled with high quality Danish furniture, including a couple of Jacobsen‘s egg chairs, and it features a wonderful FSC Douglas Fir flooring. The kitchen cabinets are made from grey recycled porcelain that are lighter than conventional materials. An old wooden door is being used as a multipurpose table, beautifully contrasting with the classic Danish furniture that will never go out of fashion. The bottom floor has a big flexible central space, making it easy to access any of the floating house’s many rooms. The sauna, which is for “sweating bad spirits away,” gets humidity from outdoor tiles and redistributes the hot air through out the house. Fully flexible, the spaces become even bigger thanks to sliding mirrored walls and the central space gas a carpet inspired by sea currents. The master bedroom is also clad with recycled porcelain flooring, which creeps into the glazed bathroom and walls for minimal, functional and sustainable aesthetics. A solution for future urban housing, hedonistic sustainable design, or just a way to think how to re-organize our lives within the cities, the INACHUS floating home represents an urban ideal. Moored within St. Katharine Docks, just minutes away from the iconic Tower Bridge, INACHUS was being built in Kent at this time last year. Featuring two floors, this house accommodates 3 bedrooms, two toilets, an open plan living room and kitchen, balconies all around and a grand terrace for some cloud gazing. Extremely energy efficient, it has solar panels, double and triple glazing, great insulation, crossed ventilation, plenty of windows and layered fins that regulate sunshine and bounce off winds stabilizing the house. Alexander Host, one of the Danish designers behind the project, kindly gave us a private tour around the space, which is also where he is staying during the Festival. We started the visit from the terrace, which has a Nordic style hot tub for extra floating in the water, great views overlooking the posh marina and will be soon topped by a green roof! 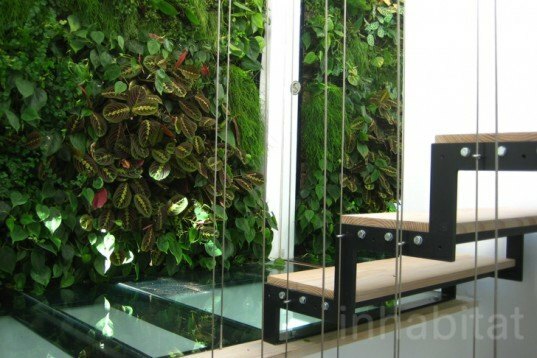 An indoor green wall greets people at the entrance and thanks to two mirrored sliding doors at both sides; the luscious vertical garden gets magically three times bigger! The light open plan living area has only functional objects, is filled with good quality Danish furniture and has a wonderful FSC Douglas Fir flooring. The kitchen cabinets are made from grey recycled porcelain that as well as saving up resources are lighter than conventional materials. An old wooden door is being used as a multipurpose table beautifully contrasting with the classic Danish furniture that will never go out of fashion. The bottom floor has a big flexible central space for sharing quality time with other inhabitants and getting to the floating house´s many rooms. The sauna for ¨sweating bad spirits away¨ gets humidity from outdoor tiles and redistributes the hot air through out the house. Fully flexible, the spaces become even bigger thanks to sliding mirrored walls and the central space gas a carpet inspired by sea currents. The on suite master bedroom is also cladded by recycled porcelain floors that creeps into the glazed bathroom and walls for minimal, functional and sustainable aesthetics. A solution for future urban housing, hedonistic sustainable design or just a way to think how to re-organize our lives within the cities, INACHUS floating home is very close to good urban life.